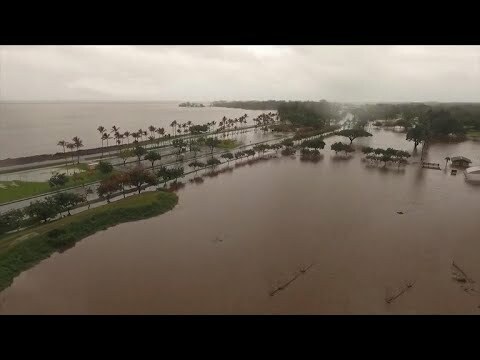 Although Hawaii avoided a direct hit by Hurricane Lane, which weakened to a tropical storm over the weekend, areas of the Big Island were inundated with waist-deep water and flash flooding. Mountain View, located on the east side of the island, received a preliminary total of 51.53 inches of rain from Aug. 22-26—the third highest storm total rainfall from a tropical cyclone in the U.S. since 1950, according to the National Weather Service. The highest total is the 60.58 inches of rain dumped on Nederland, Texas during Hurricane Harvey last year. The second highest—and the highest tropical cyclone storm total rainfall in Hawaii—is the 52.00 inches measured at Kanalohuluhulu Ranger Station during Hurricane Hiki in 1950. Authorities rescued 39 people from floodwaters on Friday and Saturday, the Associated Press reported. No storm-related deaths have been reported. The heavy downpour triggered landslides, caused a road to collapse in Haiku and rendered the neighborhood inaccessible, and even opened up sinkholes. Lane also dropped 36.76 inches of rain on Hilo Airport, the wettest four-day period ever observed at Hilo, with records dating back to 1949. Hilo also saw 15.00 inches of rain on Aug. 24, the fifth wettest calendar day on record. "It was almost biblical proportions," state senator Kai Kahele, who represents the town of Hilo, told NBC News. The National Weather Service lifted all remaining tropical storm warnings and watch advisories for the state on Sunday. As Lane drifted away, Tropical Storm Miriam developed in the eastern Pacific Ocean, about 2000 miles east of the Hawaiian islands. But "Miriam is not expected to threaten any landmass," said AccuWeather Hurricane Expert Dan Kottlowski.